Near the stylomastoid foramen, the posterior auricular nerve arises from the facial nerve and travels upward facing the mastoid process. The posterior auricular nerve arises close to the stylomastoid foramen from the facial nerve and in front of the mastoid process runs upwards. Here from the auricular branch of the vagus, it is merged with a filament as well as connects with the posterior branch of the great auricular as well as by the lesser occipital. As it ascends among the external acoustic meatus along with mastoid process, it splits into auricular and occipital branches. On the cranial surface of the auricular, the auricular branch supplies the auricularis posterior along with the intrinsic muscles. The occipital branch, along the superior nuchal line of the occipital bone travel backwards as well as supplies the occipitalis. Auricular branch of the vagus nerves. An auricular branch for the posterior auricular muscle along with the intrinsic muscles of the auricle. An occipital branch for the occipital belly of the epicranius muscle. The posterior auricular nerve follows the posterior auricular artery and stimulates the muscles of the auricle alongside the occipitalis. 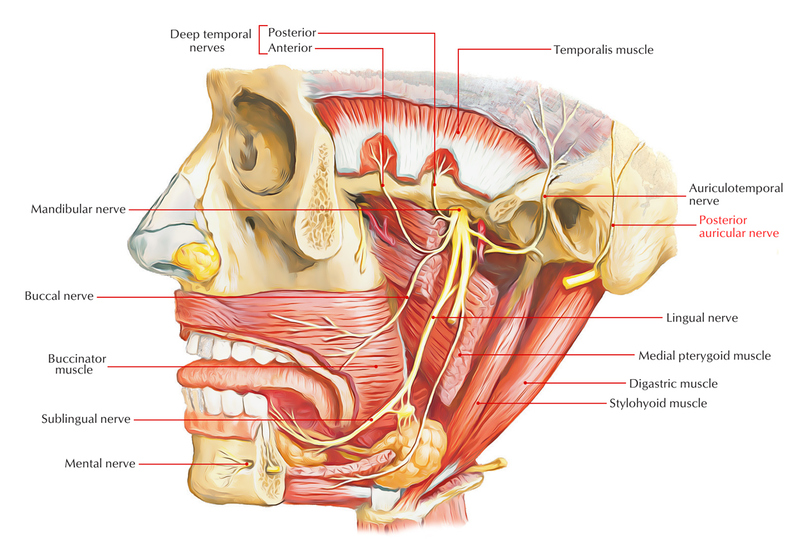 The superior and anterior auricular muscles are however stimulated via the temporal branches of the facial nerve. The posterior auricular nerve also sends sensory fibers towards the auricle.